The Zohar, Chapter “BeShalach (When Pharaoh Had Let the People Go),” Item 11: And she said, “I dwell within my people.” What does that mean? When judgment is hanging over the world, a person should not separate himself from the public, and he should not be distinguished from Above, and he should not be known separately. It relates to both the external, corporeal perception and to the inner, spiritual one. Let’s start with the latter. A unified soul was divided into many parts. “Within my people” means within the commonality that was created from the combination of the disconnected parts, which correct themselves by connecting with one another. They overcome their individual ego that repels them from one another and form “the Creator’s people.” After all, these parts share the intention of in order to bestow and by that they resemble the Creator. That is why they are called “My people.” It refers to a collection of individual, shattered vessels that gather with the intention of in order to bestow, which the Creator also has. On the corporeal plane, it means that the great masses of people are under the general Providence, which sets them in motion. Later on The Zohar speaks about judgment that “depends on the world.” “The world” means concealment, an egoistic connection, in which the general collective ego is revealed. And “a person should not retreat from the collective.” We may ask why? If the attribute of the ego, “judgment,” is revealed in the people, then why shouldn’t I escape it? The fact of the matter is that looking through the spiritual prism, I see a totally different picture. I see all my desires that depict the imaginary “external world” for me. If I discover the attribute of judgment in them, I have to correct them by the attribute of bestowal and lead this rule to the attribute of in order to bestow. This is the mission of Israel: Instead of running away from the collective, I should be inside it trying to correct it. The Zohar continues, “when judgment is hanging over the world, those who are known and registered separately, although they are righteous, are caught first.” Why? Because if a certain attribute of a person is aimed at bestowal, it is “caught first” and begins to operate in order to receive as the source of the Light lies specifically in it. It is the same in our world, as Baal HaSulam says at the end of “Introduction to The Book of Zohar” that “judgment” strikes the best of us. Therefore people who reach the heights of attainment live in distress. “The Creator’s mercy is always with all of the people together” because this is where correction is performed. So if we want to be corrected and to advance, we mustn’t detach ourselves from the public. We must do everything possible to be in it, to feel it as much as we can although it isn’t pleasant, and to worry about people, introducing knowledge, sensation, and everything possible to them just to make sure they advance. They are the Creator’s real goal and He is revealed only in our connection with the people, like the spark in the desire to receive. For thousands of years, our development continues on the inanimate, vegetative, and animate stages, which are not simple at all since they are based on the shattering of the first spiritual entity (Man), meaning the split souls. Since the moment they were shattered, each broken element includes all others in it. Each particle acquired a chance to live: to receive and to bestow, to consume and to discharge. All forms of existence emerged from two forces, receiving and giving. The desire for pleasure in its pure form cannot subsist on its own. It needs some force that acts against it, meaning that it requires the desire to bestow. After exiting Babylon, this group of people descended to Egypt in order to absorb additional, powerful desires while still being in a state of immense aspiration; it was called the “Egyptian exile.” After getting an additional portion of the desire to receive, this group was granted a chance to work with it in order to transform it into the desire for bestowal. At that time, the world’s nations used to be at an average level from which this particular group of people fell to the degree of “minus four hundred (400) years, which stands for “Egyptian exile.” It dropped 400 steps in accordance with the full circle of development, four phases of the Direct Light. While in Egypt, the group acquired additional desire, and along with the additional desire, the group exited Egypt, received the Torah, and rose to the level of the First Temple. However, it ws destroyed and fell; the Second Temple was constructed, but it again was destroyed. As a result, the group descended to the depth of the last (current) exile where we are all at this time. 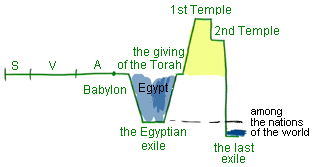 The degree of the fall that happened during Egyptian slavery equals the level at the time when the Temples existed. All of the above happened to make us drop from our prior height and reach the final shattering (exile) that continues to this date. The downfall we are currently in is so deep that we simply cannot fall any lower. From here, we can rise together with other nations and complete our correction. Each spiritual action triggers material consequences in this world. Thus, we are obligated to continue working in this material realm during the whole period of exile. Exile means separation from spirituality and the inability to produce any spiritual actions. However, since we act materialistically and pursue egoistic desires through our bodies rather than souls, we still fulfill preparatory work that is associated with the period of exile. The last exile is coming to an end and we all have to transition to freedom. The difference between exile (Galut) and deliverance (Geula) is only in one letter “Aleph,” which stands for “revelation of the Creator.” This means that we have to attain the upper world to reach the state at which the Creator fills the whole universe. The reality we live in today will stay intact. All we will do is add the upper Light, the power of bestowal, to our prior sensations and thoughts. They will fill the whole world in which we will discover the upper reality since we will obtain different corrected properties. At that point, we will understand the essence of the preparatory work that we did previously by fulfilling material commandments since we were incapable of doing anything else while we were still in exile. Thus, after we manage to return to the physical land of Israel, our present day task is to rise to the spiritual land (desire) of Israel. It is said: “Each action leaves a mark.” This applies even to material actions since we build spiritual acts on top of them. Prior generations were supposed to fulfill material work in this world, whereas our duty is to pursue spiritual activities. That is why we concentrate only on spiritual work: human intentions and desires, attitude to concealment and revelation, and the property of bestowal that we’re about to acquire. All of our many years of study (we have people who have already been studying for 10-15 years) are only intended to make you reach a state when you begin to work in the group, as you realize that there is nothing else. And everything that you have done over the course of many years was only intended to finally make you understand that the only thing that can change you and reveal to you that what you want is right in front of you, even though it is the very last step. We usually take a very long time to get there, convincing ourselves and trying to somehow wriggle out of it, go somewhere aside. We study Kabbalah, do anything we need to do in regards to dissemination—anything at all—just to avoid working in the group. And even once we already understand that there is no other solution, still, at the very last moment, we escape finding reasons to not participate in this process. We cannot allow ourselves to close our eyes, throw ourselves into the group, like in water, and completely disappear in it. A lot more time passes, months, sometimes even years, until a person finally enters the group. But we can shorten this time with our joint effort, and we will try to do it. The length of time a person has been studying does not matter, neither does his knowledge, whether he is smart or not, strong or weak, persistent, stable, or lazy. When you enter the group and join its common force, we “disappear” in it, you dissolve in the common qualities of your friends to such extent that you acquire the integration of all their abilities, and they all become yours. No need to come up with excuses for yourself, such as I am still young, I am not yet ready for this, maybe after some time, at the next convention. Now! There must be no other thoughts! There is nothing else beside this place and this action that we must take. And the action is very simple—try to perform the so-called First Restriction (Tzimtzum Aleph), rise as much as possible over our egoism without taking any of its persuasions, reasons, catches, and quirks into consideration; we must understand that this points to the faults in our aspiration, our intention. When my intention and aspiration are not strong enough, I will feel something distracting me. And this every disturbance points to what I need to add to my intention to seriously direct it and make it strong enough in its size and vector. In other words, I need to be aimed straight towards the goal and to have enough strength to direct me towards it. This is why we perceive disturbances as a given. We never resent them, we never become mad at ourselves; on the contrary, every time they appear, we rise above them, and invest ourselves even more into becoming closer with others. The main thing is to have patience towards our friends, like we are patient with small children, our favorite small child. There is nothing we can do about it; it is also our egoism, which does not allow us to connect with others and shows us where we must bring ourselves closer and position ourselves. In relation to our friends, we take into account not their personal properties, but rather something that belongs to our spiritual path. I don’t care about their everyday problems. We sweep all of this aside and forget everything that exists around us. We are interested only in one thing—their aspiration upward! This is their point in the heart and I am dealing with it! This is my tuning point! It absolutely doesn’t matter to me what properties they have. They may be impatient, good, or not so good: It doesn’t matter! All of these are our animal earthy properties. They all stay at the level of our world. The most important thing for me is to unite with their point in the heart. This is what they aspire to the same way as I do. The tuning in the group is a very special and fine action.